In the last decade the city and the urban have been reframing how we perceive the world and its challenges. Urban Studies programmes in universities are multiplying, while ‘cities’ sections are becoming a regular feature in major broadsheets; the world’s cities and the issues they face engage not only a growing community of experts, but equally the interest of a much broader public. And how not to, when at the start of this decade urban areas became home to the majority of the global population, and when currently the world is undergoing the largest wave of urban growth in history. Urban Transcripts was itself born of a desire to explore the City as a complex phenomenon in a participatory and cross-disciplinary way, partly in response to a perception of growing disconnection amongst the various disciplinary approaches and tools of city-making. A significant part of our work in the first few years has been on the critical exploration of cities through annual programmes of events — exhibitions, conferences, and workshops — focused on, and hosted in, a different city every year, that brought together the work of artists, researchers, architects and urban practitioners. The Urban Transcripts Journal continues this journey. Our mission is to advance a multitude of knowledges of the city formulated through creative media, research inquiry, architecture, urban design and planning practice. 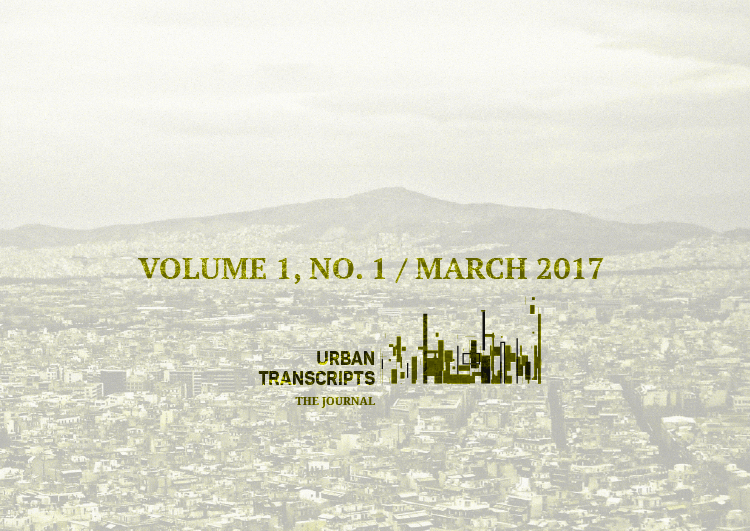 The journal brings together theory and practice in a creative, analytical, and critical discourse on the city; an urban transcript where the arts and the sciences of the city complement and confront one-another. For our inaugural issue we revisit some of the work presented in past Urban Transcripts events in Athens, Rome, and London, further complemented by contributions from people we have collaborated with in later projects. We look forward to publishing your submissions in the coming issues. Combining articles with visual work in photography, film and drawing, urban projects and interventions, mapping and urban visualisations, this is not, just, a journal; it is connecting theory and practice, creative experimentation and academic scholarship, critical readings and innovative projects, experts and the public.